Fractured boulder of basalt breaks with a chonch-shaped pattern because it is strong and uniform in strength. Appreciation – Every historic stone wall is also an archaeological artifact, animal habitat, ecological boundary, rock collection, and aesthetic object. The more we appreciate what we see, the more likely we are to manage it well. Investigation – There is an astonishing dearth of research on the origin of stone walls, their impact on woodland ecosystems, and their importance in literature, art, and environmental history. Though we haven’t taken them for granted, very few have been taken seriously as scientific objects. Conservation – Though the pace has slowed, the authentic stone walls gracing the New England countryside are still being strip-mined for their stone, much of which is being shipped beyond the local source areas for use in the construction industry. We must stop this export and re-arrangement of our history. Education – Stone walls provide an opportunity to link aspects of geology, ecology, social studies, math, art, physics, and environmental science together in school curricula from the elementary to the high school levels. Many kids are as fascinated by stone walls as they are by dinosaurs and volcanoes. 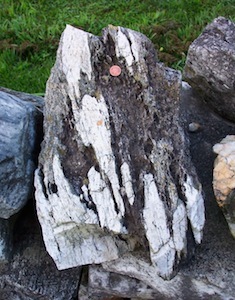 Silica-rich and silica-poor zones in the marble of western CT give this stone a zebra-like appearance. The effect is strange when the whole wall is built of them. Penny for scale.